Vibrational medicine was the name we chose in 1992, together with a Colombian colleague – Dr. S. Rojas- to name the Medical course we gave in the Nestinar Centre in Barcelona (1992-1993). We founded the “Escuela de Medicina Vibracional Nestinar” (the Nestinar School of Vibrational Medicine). Ontomedicine (the medicine of the Being), is the name I give to my specific praxis within V.M.. 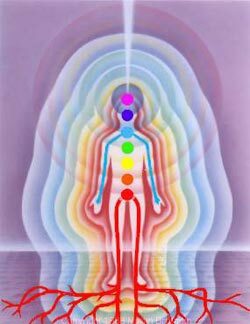 It is the result of my personal research, since 1990, into the relationship between Body-Mind-Human Energetic Field (H.E.F.) which integrates information from medicine, psychology, philosophy and modern physics from which I have created my own therapy method. What is Vibrational Medicine or Ontomedicine? From the philosophical point of view, it considers the Human Being as a unity in itself (body – mind – spirit) and with its environment. From the scientific point of view, V.M. is based on the concept of modern physics and is the application of Einstein’s physics and modern quantum mechanics to medicine. If we apply the Einstein paradigm to the human being, we could define it as ” a multidimensional unit of interconnected energy fields ” (of which the physical body would only be the most dense part, with the slowest vibrational frequency). In this energy field there are the emotional, mental and transcendent-spiritual levels which were mentioned at the beginning, each of which corresponds to vibrational frequencies which are different to the physical body and successively higher or subtler. We thus have what we could call a subtle anatomo-physiology, which directly affects the known physical body. Health is the result of our subtle energy system together with the forces of our physical vehicle and also the forces of nature. The origin of illnesses are not physical , at first, there would be an alteration in the H.E.F. energy flow and this would later lead to neuro-endocrine imbalances and to known physical pathologies. Therefore, if we treat the H.E.F. alterations before they become somatic, we are really practicing Preventative Medicine. Once physical illness has developed, the treatment is causal. -Ill people are treated and not illnesses. Specific and individualized attention. -The treatment treats the different levels of being simultaneously, in other words, the emotional, mental and transcendental levels are treated as well as the physical levels. -The pathological patterns are restructured until the attainment of the patterns of initial order, particular to the state of health. – Finally, and most importantly, is the need for the conscious participation of the patient, so that the patient becomes an agent of his or her own health, adopting an active and responsible role in their lives.